The hardest part was the first step: deciding exactly what I wanted my painting to be of. Not only does 1st Art Gallery boast more than 250,000 paintings to choose from on their website, but they also offer a portrait service and can turn any photograph into a handmade painting. And since it's all custom-made and hand painted, their paintings are made to order and can be reproduced in any size. As an art history lover, I knew right away that I wanted to pick out a painting rather than submit one of my own. (Although, I love the idea of commissioning a reproduction of a family or wedding portrait someday!) First, I made a list of some of my existing favorite artists and paintings. Then, I spent hours upon hours (really) sifting through the thousands of artists and paintings. New favorites kept popping up, so I kept bookmarking them. I eventually decided I wanted something by Alphonse Mucha. One of my favorite artists, he produced many paintings, illustrations, advertisements, and designs during the late 19th century. He painted his female subjects on posters advertising everything from alcoholic beverages to baby food. Plus, he was Czech. 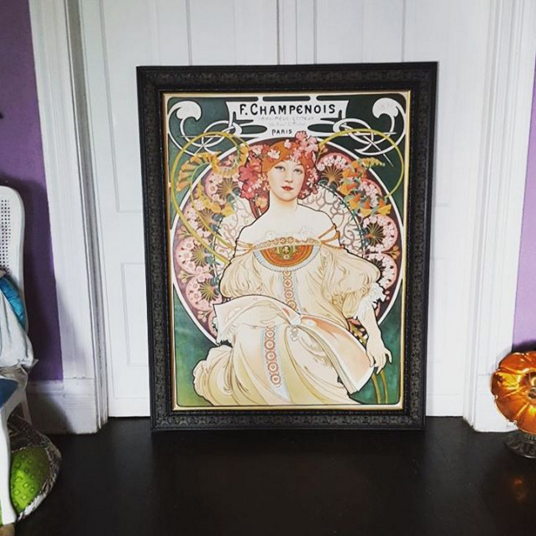 Since the town I live in has a heavy Czech influence and Mucha-inspired art throughout the city, I thought it'd be a perfect way to commemorate living on my own in my own place. The only problem? I go ga-ga over almost all of Mucha's work. 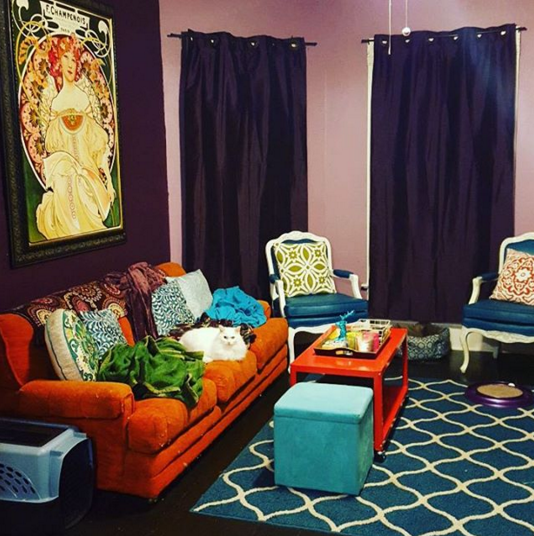 I took a good hard look at my living room and its colors. I wanted something that would complement my orange/turquoise/purple color scheme without being too matchy-matchy. I wanted something that could subtly introduce other colors. And I wanted something quintessentially Mucha: a lovely woman, an intricate Art Nouveau aesthetic, and glorious composition. I ordered my painting and then waited patiently. Since these are hand painted, it takes a bit of time. I waited 3-5 weeks for it to be painted, then another 3-4 weeks for the framing. 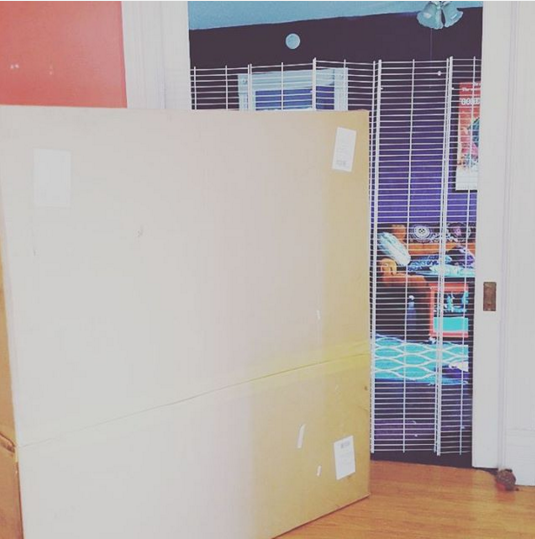 And soon enough, my painting arrived – in a very large package! I was really impressed with how the painting was packaged. This is custom, hand painted artwork – 1st Art Gallery values their product and made sure that it was packaged as carefully and conveniently as possible to ensure its safe delivery and avoid any damage. Here it is when I got it all unpacked! It's 36" x 48" and I could not tear my eyes away. It's gorgeous. I love that an artist really did paint this. It's amazingly close to the original and the quality is great. With so many elaborate details and such a range of colors, I'm so impressed by the artists' work. 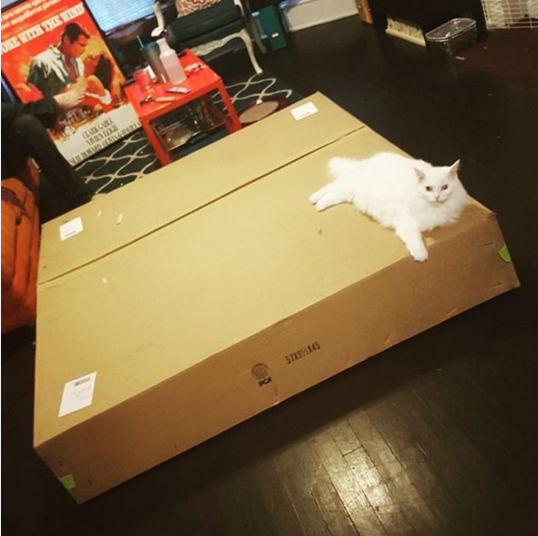 I didn't know what to expect regarding the frame, but I was equally impressed. The frame is of very high quality and is really beautiful. The mounting hardware on the back was easy to work with. With a little help from my boyfriend, we got my new artwork up on the wall! Here it is! It's huge! I love it! And I love how the bright colors pop against the dark eggplant wall. 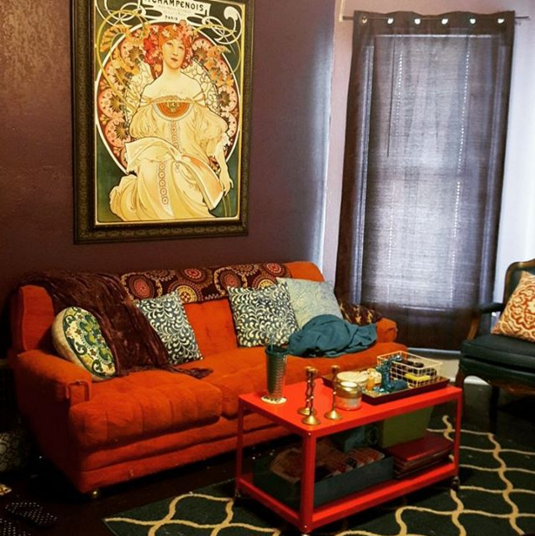 I feel like it really ties my living room together and adds an additional layer of Czech Art Nouveau to my Bohemian-inspired space. Here's another shot. Since hanging the painting, I've also brought in a few more green accents to pick up on the emerald green background. My experience with 1st Art Gallery was awesome. They were helpful in answering my questions, the quality of the painting and frame was wonderful, and the packaging/delivery was great. I will definitely plan on purchasing from 1st Art Gallery in the future. I know that I'll be paying for quality, care, and a custom made reproduction hand painted by a real artist. 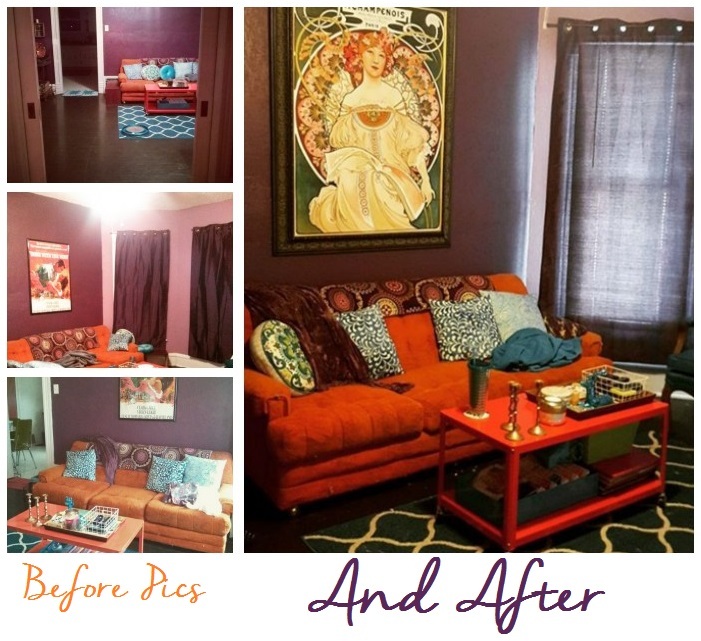 Want to learn more about what it's like to have your own photograph turned into a painting by 1st Art Gallery, check out this blogger's post. Thank you, 1st Art Gallery, for the delightful experience and a piece of art that I'll keep forever! So if you could pick out any piece of art to have hand painted, what would you choose? I'd love to hear about your favorite paintings and artists! EXCELLENT choice! 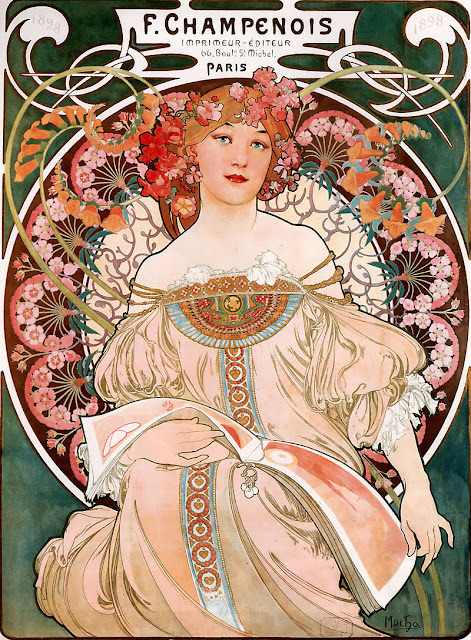 I'm a huge fan of Alphonse Mucha and the entire art noveau movement! I absolutely love it.